Abbey Brooks is ready for her sophomore year. She’s determined to get her driver’s license, come out to her mom,, live through basketball season, and get–and keep–a girlfriend. With Abbey Brooks, though, nothing is ever as easy as it sounds. I love Abbey as a narrator. She’s funny and effervescent, not to mention self-effacing at times. Mostly, she’s honest when dealing with her feelings, and her ever-changing world of friends. 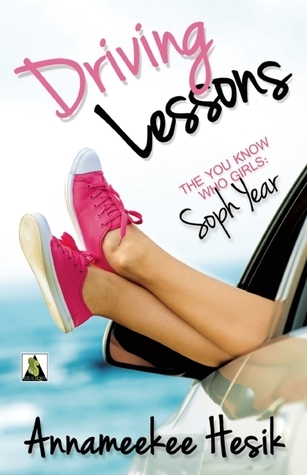 “Driving Lessons” is the second book in the “You Know Who Girls” series, which centers on a group of high school lesbians. The first novel in the series is “The You Know Who Girls: Freshman Year,” where we meet all these characters for the first time, including Abbey’s first girlfriend. I haven’t read the first book (yet), so I missed much of the background on some of these well-drawn characters. However, author Annameekee Hesik has framed “Driving Lessons” so that even a newcomer to the series can follow along. If there is background information necessary to further the plot, she seamlessly weaves it into this narrative. It’s a difficult thing to do in series fiction, and Ms. Hesik pulls it off with great aplomb. I never felt lost from not having read book one; I did, however, go and buy book one, just because I’m curious about Abby and her Freshman Year adventures. Although I think anyone would enjoy this novel, one of the most valuable things “Driving Lessons” does is acknowledge that high school is difficult enough without the added pressure of being lesbian. “Driving Lessons” helps show that such readers are not the only ones in that situation, and that it is possible to find friends–even parents–who will love and support you no matter what. Also, in the Acknowledgements section at the end, Ms. Hesik provides numerous resources where LGBTQ teens can turn for advice or other help. Not everyone’s parents are as cool as some parents in the book, and these websites and phone numbers are there to help. Abbey Brooks may not be the smoothest kid in school, but she has a huge heart, and that makes her adventures–and this book–well worth reading. This entry was posted in Books, Books Read in 2014, General Fiction, LGBT, Romance, series, Young Adult. Bookmark the permalink.